The first-time you launch the Syncplicity application, you are shown a tutorial. After installing Syncplicity, you are presented with a window where you can synchronize each folder in your Syncplicity account to your Mac. These windows also appear when you create a Syncplicity folder on another computer, or when someone shares a Syncplicity folder with you. 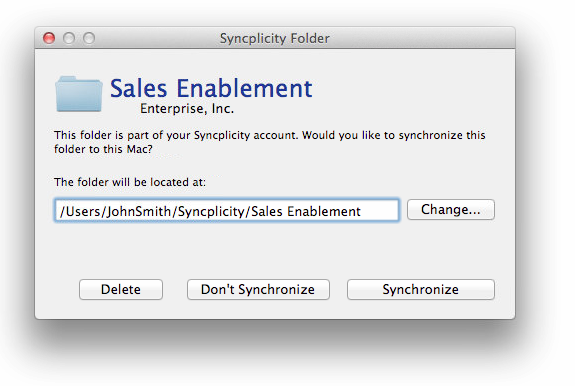 Click the Synchronize button to synchronize the files and folders within this Syncplicity folder to the location on your Mac that you have selected. You can select a different location using the Change button. Click the Don't Synchronize button to have the folder remain in your online account but not be synchronized with your Mac. Click Delete to remove the Syncplicity folder and all of the files and folders inside of it from your Syncplicity account. The files and folders remain on your Mac and any other computer that you are synchronizing, but they are no longer synchronized by Syncplicity. When done, your changes are saved and your computer automatically begins to backup and synchronize your files. You may notice the Syncplicity taskbar in the menu bar.